THE RED TEN #10 of 10 - Final Issue! ComixTribe's longest running maxi-series finally comes to a thrilling conclusion! The critically acclaimed superhero whodunit FINALLY comes to a shocking conclusion. At last, the mastermind(s?) behind the carefully orchestrated destruction of the world’s greatest super team is revealed, and ultimate punishment is levied against the one “hero” still standing. All your lingering questions will be answered in extra sized final chapter of THE RED TEN. - The Killer is Revealed at Last! - A Final Word of Thank You On Behalf of the Creative Team. 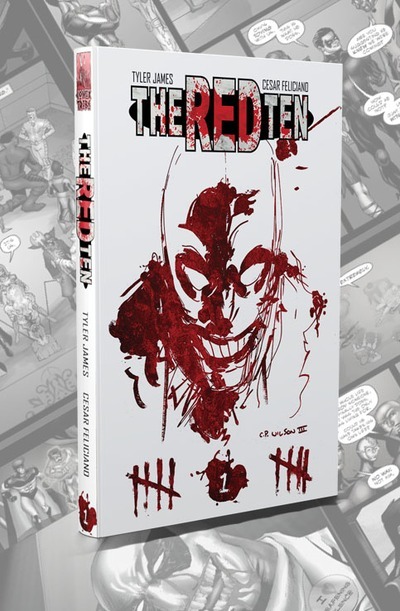 THE RED TEN VOLUME 1 (Available in Softcover & Hardcover) - Click Here for Special Sale Price! THE RED TEN Vol. 2 Single Issue Sets - Click Here for Special Sale Price!